Somewhat coincidentally the opening track of the new PJ Harvey album sounds remarkably similar to something – tonally at any rate – that the recently deceased John Barry would have dreamed up to support the wacky adventures of Moore and Curtis in the late 60s/early 70s. After that we get back to the angular guitar rock we associate with Ms Harvey – albeit somewhat translated into a lighter mode getting close to “White Chalk”. 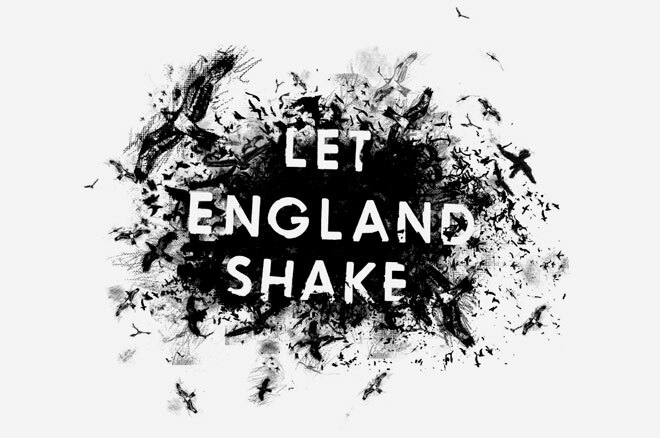 There is a theme throughout this album about the dissolution of empire, the foriegn policy of the last ten or so years and the position of England in the great scheme of things in the 21st century. It is only by the third track “The Glorious Land” that I start to get comfortable with what I am listening to. Polly’s scribbled guitar and folky refrain seem right for her at this point in her career. The lyrics are more mature than the previous album with John Parish, and the wacky use of a bugle makes sense. What really makes me smile is the use of the voice, which is back to her best. “The Words that Maketh Murder” continue this with the vocals taking centre stage – adopting a minimal blues type feel crossed with something from the english folk tradition – there are elements of Percy Plant doing the folk stuff with Led Zep, and possibly something Country Joe and the Fish might have dreamed up. There is also a direct steal from the lyrics of “Summertime Blues” which is a hoot. “All and Everyone” sounds vaguely 60s protest song – which fits in well with the themes approached throughout the album – all lo-fi organ and acoustic guitar – but then sort of gets a bit prog and serious – Moody Blues perhaps – I don’t know. Doesn’t sound like Polly Jean though – sounds like someone else…..not sure about this one at all. Things continue in this vein with the traditional 50s guitar progression we all know and love which then rather wonderfully moves into something rather magical – harking back to to the work on White Chalk – “On Battleship Hill” is Polly at her best – high register vocals and ethereal guitar and piano. “England” is interesting – ululating backing vocals underpin a wracked and tortured lead vocal over strummed acoustic guitar – this is probably the performance of the album, heart felt and emotionally strong, and with a complex musical structure which takes the music somewhere new and unique. The baleful slow rock of “In the dark places” is more typical of earlier work but still manages to capture the essence of more recent releases. At this point it really does sink in that it’s all about the voice and what you put round it to strengthen the delivery – the theme of war, loss and anger with that comes to the fore here reflecting, with real passion, the disappointment around the changes to the nation’s status in the world and its actions in that context. “Bitter Branches” takes us back a couple of albums again and I’d guess this is a song from around that period given the similarity in feel – however the more upfront use of guitar makes this a little different – again its intense but maybe the vocals are a little too low in the mix. “Hanging on the Wire” also fits in this overall feel. “Written on the Forehead” is a strange melange of soulful ragga backing vocals and typical Polly melodies – another highlight for me in that it manages to sound new, although it does get noticeably close to McCartneyesque chorusing in parts. I love the shuffling feel to this track – a real mojo mover. Matters conclude with the folky protest song “The Colour of the Earth” where John Parish takes the lead – almost child-like in its delivery it has a real 60s feel. Overall there are some highpoints here but I get a sense that this is not a selection of tunes that were all done at the same time and there is a sort of schizophrenia between the White Chalk era type tunes and the folk oriented elements of some of the later songs. Can’t help feeling though that if she strapped on an electric guitar and gave it all a bit more mojo then it would be more satisfying overall. A curates egg of an album probably sums it up. Posted on February 8, 2011 by HalfEdgeMediaPosted in Album ReviewTagged PJ Harvey.